The state's dwindling milk producers toil every day in operations that are particularly fraught with financial uncertainty. Is it any wonder some are closing the barn doors for good? 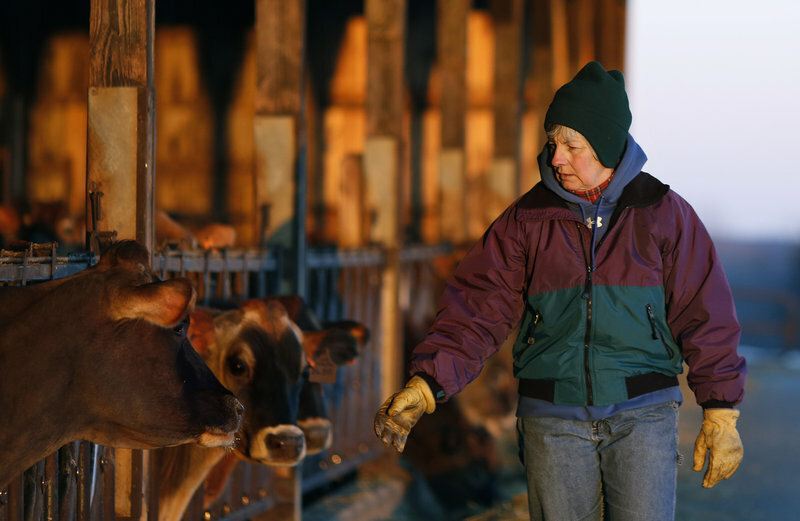 Libby Bleakney rises at 2 every morning to start milking a barn full of Jersey cows by 3 a.m. The milking at Highland Farms in Cornish takes about four hours and is followed by breakfast, then office work — or, depending on the season, haying. Libby Bleakney, a fifth generation dairy farmer who runs Highland Farms in Cornish with her family, says keeping the operation going is more than preserving a legacy – it's in her blood. 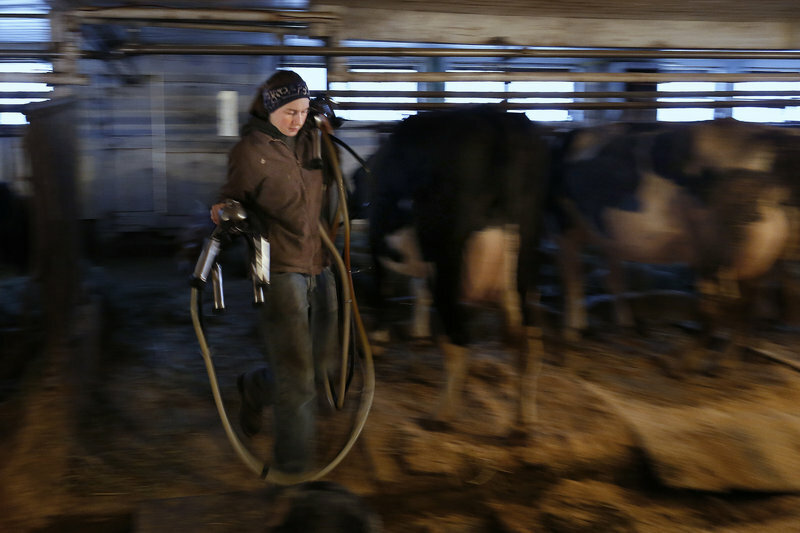 Alison Leary carries equipment as she milks some of the 17 remaining cows at her family's farm in Saco last month. Because of low prices for milk and soaring production costs, her father, Tim Leary, has opted to close the 500-acre Leary Farm, the last commercial dairy operation in the city limits. Alison Leary squirts a stream of milk into the mouth of her Australian cattle dog, Pepper, during morning milking chores last month. After the Saco farm closes its dairy operation, she plans to keep a few cows to produce enough milk to make products such as cheese and yogurt. The afternoon milking starts by 2 p.m. and goes until about 6. Bleakney tries to be in bed by 9 p.m. so she can get some sleep before rising at 2 and doing it all over again. Despite all this hard work, the dairy operation on the farm is losing money. And that’s the norm rather than the exception for the state’s dairy farms. Maine dairy farms have always struggled to make ends meet — even with the help of federal and state safety nets — but big spikes in fuel and grain costs last year hit them hard. Now many of them are teetering on the edge of going under. 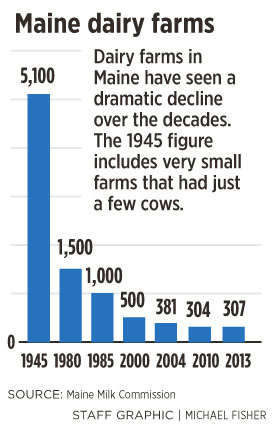 Maine has 307 dairy farms, down from about 500 in 2000, and every one of them is family-owned. That’s a fraction of the number of dairy farms operating in the state 50 years ago, and the number is decreasing with each passing year. There are numerous reasons for the decline, some as simple as the fact that as farmers have aged, there are fewer younger farmers willing to replace them. Farms have either gone out of business altogether or shifted their focus to something other than a dairy operation. 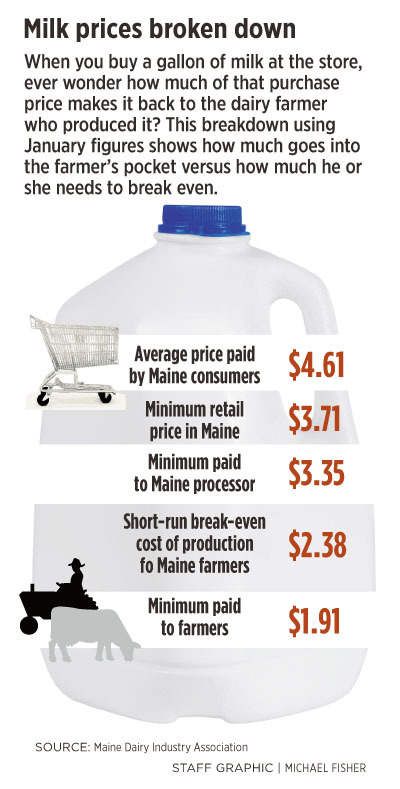 Maine farms also have inherently higher costs in some areas. Feed for the cows, usually a farm’s largest expense, must be purchased and shipped to Maine from other parts of the country. As booms and busts in dairy pricing become more extreme, these costs take a greater toll on a farm’s bottom line. But mostly, farmers blame a federal price support system that favors the larger, industrial-style farms in the Midwest and West over the nation’s smaller dairy farms. Last year, the price of milk dropped, and dairy farmers absorbed the loss — as they are used to doing. Then came the drought, and grain prices went through the roof. 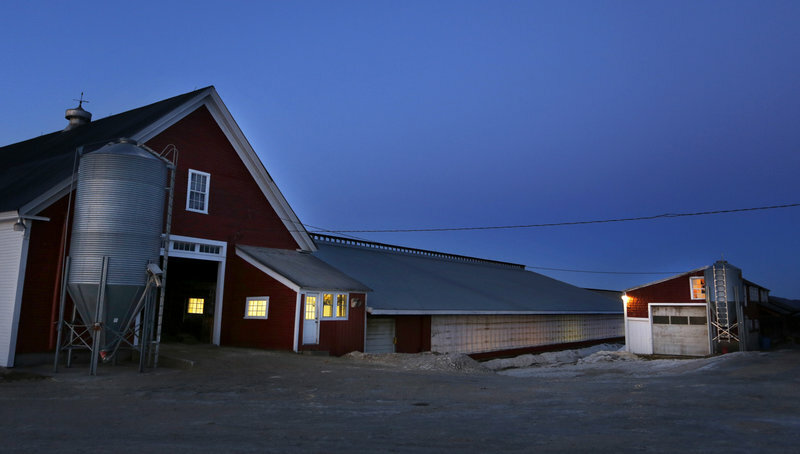 That was the final straw for Leary Farm’s dairy business in Saco. In January 2012, Tim Leary paid $380 a ton for feed. Feed prices started going up in summer and peaked at more than $500 a ton, “to the point where it was frightening,” Leary said. Leary has just made the decision to stop dairy farming before he gets into deep financial trouble. His family’s 500-acre farm, which at its height milked about 50 cows, is the last commercial dairy operation in Saco. Leary is converting part of the farm to a vegetable operation. His daughter, Alison, will keep a few cows to make value-added products like cheese and yogurt, and the family will keep a cow or two for their own needs, but Leary has begun gradually selling off his herd. The state’s dairy-relief program is designed to throw a financial lifeline to Maine’s dairy farmers when the market gets unstable. When dairy farms are paid less for their milk than it costs to produce it, they get a check from the state that comes from a pool of money funded by Maine dairies. The amount of the check is based on the federal minimum milk price and other factors. The price-support payments are triggered at a set amount, depending on the size of the farm. For example, Maine’s smallest farms are currently guaranteed $21 per 100 pounds of milk — or $21 per hundred weight, as they put it in the industry. (A hundred pounds equals 11.6 gallons.) When they’re paid less than that in the marketplace, it triggers a payment from the milk fund. From 2007 to 2009, the state dairy safety net paid out $30 million to Maine dairy farmers, according to the last survey that looked at production costs. Historically, the program has helped save some farms: From 2004 to 2010, Maine lost 19 percent of its dairy farms, while Vermont and New Hampshire lost about half of theirs. But now dairy farmers are faced with dramatically higher feed and fuel costs. That same small Maine farmer who is guaranteed $21 per 100 pounds of milk is finding that it now costs $30 per hundred pounds to produce it. For its part, the federal price-support program provides only “pennies” to Maine dairy farmers, said Tim Drake, executive director of the Maine Milk Commission. Most farmers view it as better than nothing, but it’s not enough to help them break even. Farmers took another hit earlier this winter when Garelick Farms, a Bangor-based dairy processor, closed down, leaving only two large dairies in the state to purchase their milk — Oakhurst and Hood. Garelick had been contributing about $50,000 a month to the state milk fund, so that money is lost; the other dairies do not have to make up the difference. And if the milk Garelick Farms bought now starts going to processors outside of the state instead of a Maine dairy, that could mean losing even more money from the fund. Bleakney says those “input costs” should somehow be figured into what dairy farmers are paid to better reflect the marketplace. Commercial dairy farmers have been working for years on a better milk price-support formula to pitch to the U.S. Department of Agriculture, Bickford said. But the agency has been reluctant to open a hearing on the matter as long as Congress is still discussing the farm bill, and large industrial milk producers are not pining for it. “Between the drought and the impacts ethanol subsidies have had on the price of corn, it’s just gotten so unaffordable” for farmers, said Pingree, who is married to S. Donald Sussman, majority shareholder of the Portland Press Herald/Maine Sunday Telegram. “They need a better price-support system, some of which is in the farm bill if and when we ever get it passed — we will get it passed sometime. So farmers, who have to feed their cows, are juggling their finances in order to keep the grain bills up to date. Now the financial pressure is being pushed onto fuel companies, veterinarians, equipment dealers and other related businesses. If dairy farming is so hard, and there’s so little financial return, why do people stick with it? The barn on the Leary Farm in Saco was built in the 1850s, and there has been a commercial dairy operation on the property for 66 years — ever since Tim Leary’s father, Jim, graduated from high school in 1947. Oakhurst has bought the farm’s milk for 32 years. Jim Leary, 83, devoted his entire life to the dairy, and his son admits that weighed on his mind when he was making the decision to shut down. Some members of the family were not happy about it — until he showed them the numbers. When Tim Leary was growing up, his mother never needed to work off the farm. She took care of the house and children, while Jim took care of the farm and paid the bills. Like the Leary Farm, Highland Farms in Cornish also has deep roots in the dairy business. Founded in 1886, it’s always been a commercial dairy operation. The farm sits atop a hill high above the town of Cornish, with stunning views of the mountains, even in winter. Bleakney’s grandfather purchased surrounding farms as they went out of business, and over the years the family’s property has grown to 1,200 acres. Today, the farm is owned by the fifth generation of the family — David and Lorie Pike, Libby Bleakney and her brother, Daniel Palmer, with whom she manages the dairy operation. All of the farm’s milk goes to Oakhurst. About 20 years ago, the Cornish farm started a logging business to help supplement its income. Five or six years ago, the farm also started selling compost wholesale to nursery and garden centers. Libby Bleakney can’t imagine not being a dairy farmer. Sometimes it’s Bleakney’s cousin or children who do the day’s milking — they swap out shifts with each other so they all get a break — but it’s always a member of this fifth-generation farm family tending their 260 cows. But for Bleakney, keeping the farm running is about more than preserving the family legacy. Dairy farming is something that gets in your blood after years of rising before dawn and long nights easing a new calf’s way into the world. Tim Leary is a little wary of how he’ll respond to the changes that are coming his way. Giving up one 9-to-5 job for another one is just a job shift, he notes, but giving up dairying means he’ll have to learn how to let go of an entire way of life. Leary is, in a way, comforted by the hard facts he finds in his financial records. He doesn’t see a huge shift in the fortunes of dairy farmers coming anytime soon. And that makes the letting go a little easier. For the Learys, the long, slow slide has come to a gentle end. When Jim Leary started shipping milk back in the 1940s, there were 50 dairy farms in Saco. Some of them were very small, but there were 50. By the time his son Tim graduated from college with a degree in animal science in 1981, there were just 12 to 15 dairy farms in the community. Now the Leary Farm is the only one left. The farm’s margin was thin before the price of grain soared last year. This year, it disappeared. Leary says he can no longer afford to replace or upgrade anything on the farm. The decision to shut down has been tough, he said, but he is at peace with it. He has begun gradually selling off his cows, but will probably milk through the winter to keep himself busy. “I don’t have an end date,” Leary said. “I don’t know when it will come to an end.